With the warm summer sun shining in the window and the office screen becoming tiresome, a sense of adventure was luring me from my seat. Time to plan a getaway; a trip to places undiscovered, to refresh, and reveal the treasures within my own backyard. Beyond the urban streets of London, Middlesex County’s rural roads are quiet, meandering along lush fields and cool forests. Our first stop was at Arrowood Farm, a ‘’pick your own” blueberry farm near Melbourne. A warm welcome greeted us from the owner Phil. We were about a week early for peak berry season, but Phil ensured the berries would be ready soon, from mid-July to mid-August. He explained that upon arrival berry pickers would stop at the ‘berry shed’ to grab a stool, (talk about luxury berry picking), basket and receive picking tips. Walking back to the fields we passed gorgeous gardens, a large pond with singing toads, and a curious turtle. The farm is transitioning to organic farming practices and as they intend to plant a tall grass prairie to create a home for endangered species beside the blueberry patch. 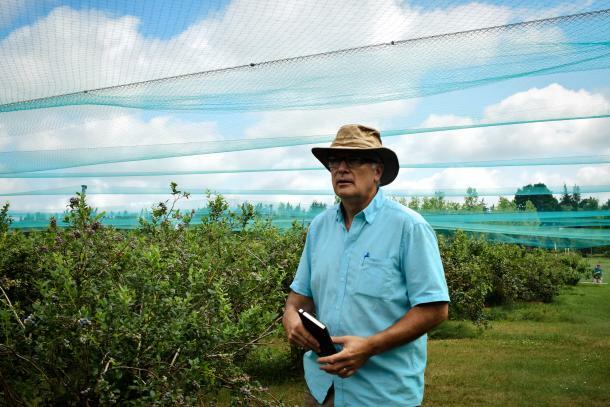 The blueberry fields are covered with a high net to keep the birds away from the tasty berries. After exploring the yard we headed into the Harvest Table room. With twinkling lights above, gorgeous wood beams and a stone fireplace at the front of the room, you could easily see why it is a favourite spot for intimate weddings. A stone patio and sitting area in the rear makes a great spot for the party to spill outdoors or for the perfect photo-opp. As we peeked in you could smell the waft of fresh baking and Phil’s wife Kathy emerged offering blueberry pie squares and blueberry lemonade. She generously offered a taste and I could easily have hoarded a stash of these yummy treats to nibble on throughout the day as we continued our road trip. In the Mount Brydges area, the Kusterman’s have developed a unique family fun destination. It is evident on arrival, as impatient kids urge their parents to hurry up towards the main attraction. As I checked out the options ahead, my inner child shared their excitement. There’s jumping pillows, child friendly zip-lines, play houses, a rope swing landing you in a hay stack and an awesome petting zoo. Cones of animal food, for purchase, allow an up close experience with the animals, especially the very hungry sheep and goats. At the far end of the property is a look-out hill to see out over the farm. Best of all, it’s got two long tube slides to ride down. The farm also provided pony rides, a berry train and a pedal kart track and in the fall months, corn mazes, haunted barns, and pumpkin patches. 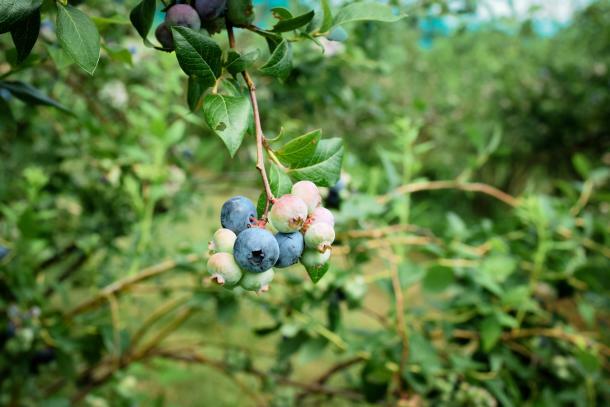 You can take a break from the play area and enjoy the seasonal blueberry and raspberry picking. A fabulous country store offers all you need to keep your hunger cravings satiated and to pick up a few keepsakes and new kid favourites. Be sure to give your family lots of time for active play as this is sure to become a preferred attraction on their repeat visit list. While in the area a stop at Strathroy’s Clock Tower Inn and Bistro is perfect for an overnight visit or delicious meal. This restored heritage landmark was designed by Thomas Fuller, chief architect of Canada’s Parliament Buildings. The Inn offers eight luxurious rooms, all named after British royalty. Its rooms are decorated in richly coloured tones and offer first class modern amenities. 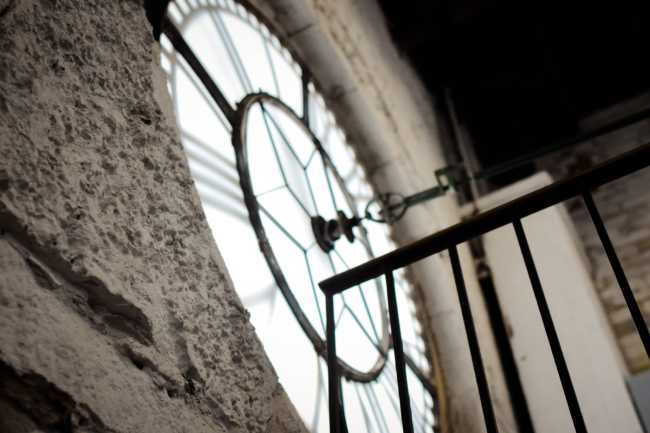 Guests can request a private tour of the beautifully restored 120 year old clock. It is well worth the climb and we shared Chef Mark Graham’s excitement as he shared the hand wound stunning timepiece. Chef Mark’s acclaimed background and commitment to local and seasonal fresh foods inspires tempting breakfast, lunch and dinner menus. Our visit included a memorable lunch where we shared the delicious turkey-cranberry-brie croissant with a generous side of crispy sweet potato fries and a specialty vegetarian harvest pizza. 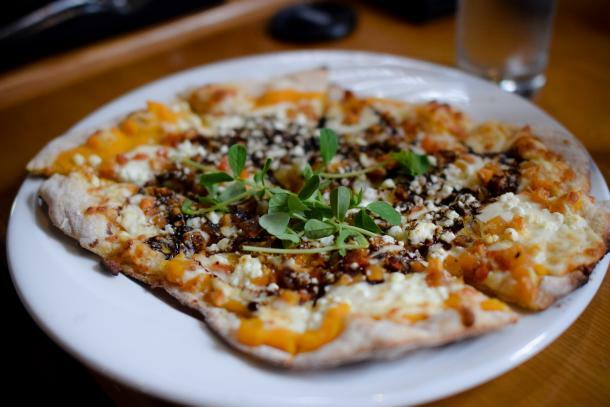 Chef’s creativity came through in the sweet potato and rosemary infused pizza dough topped with roasted root veggies and Ontario goat cheese. Yummy! Another not to be missed Middlesex County destination provides a great excuse to send the kids to the grandparents as you escape for a couple’s weekend. Texas Longhorn Ranch offers a little piece of country heaven with a unique twist of cowboy chic. 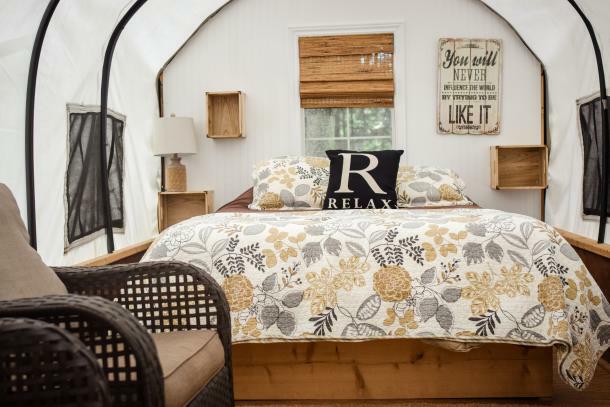 As an adults-only Covered Wagon B&B, Gail, the city girl and Fred, the cowboy, have developed an unforgettable ranch style retreat known for its exceptional hospitality. Gail’s attention to detail is evident throughout the property ensuring every ‘city girl’ will feel pampered here with one of the largest private swimming pools I had ever seen, in addition to washrooms with personal makeup vanities for all of the women. As you follow the woodland trail you emerge to find six covered wagons offer charming, uniquely styled accommodations. Each offers a cottage-like oasis with a queen bed and sitting area. Well-appointed washroom facilities are conveniently located by the wagons. The ‘Beans and Bags’ Coffee House is also nearby, stocked with freshly brewed morning coffee and teas. For an evening treat you might want to try the maple marshmallows to roast over your campfire. There are three fire pits where you can enjoy the peaceful serenity of the night and the dancing fireflies. Of course, every ranch needs animals and with 23 horses this is one of the main draws at Texas Longhorn Ranch. Guests can enjoy horseback rides through guided trail rides along the river, up hills and even alongside the ranch’s cattle. Daily guests are also welcome to join a ride with a minimum age requirement of 10 years. Fred will be sure to saddle up the ride stead for your adventure. For adult overnight guests, delicious breakfasts also get star billing in the stunning, wood-beamed Ranch room. BBQ’d steak, chicken or salmon dinners are also hosted here for guests who have pre-booked. Gail’s guests comfort is foremost as she welcomes you as a treasured friend. Middlesex County offers first-class hospitality and exceptional experiences for family fun and grown-up getaways. Its nearby proximity ensures you’ll spend more time exploring your destinations and less travelling there.